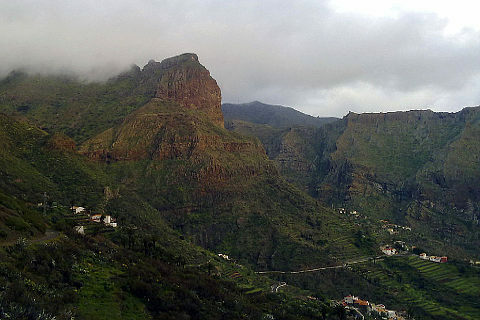 Masca is Tenerife's most beautiful village set in a superb mountaineous location. Masca is a village set in the Teno Mountains on the western side of Tenerife. Its location is stunning and because it is quite difficult to get to on a road full of tight hairpin bends it has been relatively undiscovered until recent years. Indeed there wasn't a road at all before 1991 and led to Masca being known as the 'forgotten village'. Masca is the most beautiful village on Tenerife and its houses appear to cling onto the edge of the rocky mountainside on which it is built. As well as the deep ravines and dramatic views the surrounding vegetation is lush and adds to the beauty of the site. In the centre of the village there was a bar and a tiny church but its popularity means that a number of restaurants and shops have now opened to cater for tourists. If you are fit and feeling energetic there is a walk from Masca to the Bay of Masca on the coast. The walk goes through stunning scenery and weird rock formations. The return trip takes 6 hours. If you came by coach it is possible to do just the downhill walk to the coast (still a strenuous walk though) and then get a boat to Los Gigantes where your coach will pick you up. The cliffs of Los Gigantes (the cliffs of the giants) are magnificent sheer rock cliffs 500-800m high and well worth seeing. If you are a nervous driver it is well worth taking a coach as the roads are hair-raising. The bends are so tight that only small coaches can do the trip. Apparently it is not unknown for locals to have to drive visitors back down the mountain as they are too nervous to do the return journey! However don't be put off, the scenery on route to Masca is almost as good as the village itself and so it is well worth finding a way to do the trip. 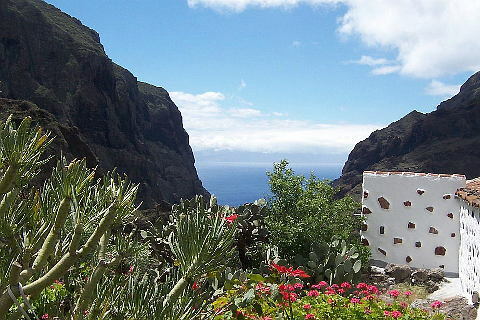 From Masca itself you get splendid views of La Gomera, one of the other Canary Islands, framed on either side by the walls of the ravine - definitely one for your instagram account! The village itself with the mountainous surroundings, the colourful flowers, cacti, forests of palm trees and cypresses, blue sea and sky all make the whole trip a photographers paradise. Heading back to the coast the dramatic cliffs of Los Gigantes are quite a spectacle. The cliffs are best seen from the sea but luckily many of the whale watching tours pass by here so hopefully you would get to see cliffs and whales!